The first nuclear reactors for commercial civilian applications were developed in the early 1950's. 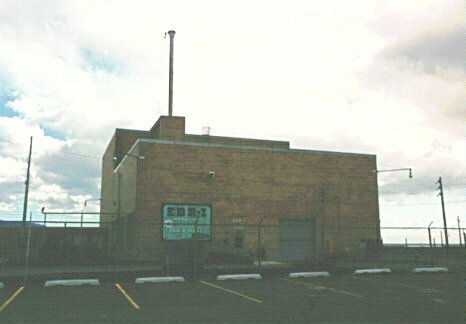 In 1951, Experimental Breeder Reactor (EBR-1), located at the National Reactor Testing Station in Idaho, was completed and was operated by Argonne National Laboratory. 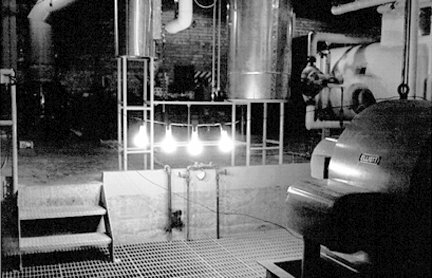 In the first demonstration of nuclear-generated electricity in the United States, 4 light bulbs were supplied (Right hand photo) . EBR-1 was a prototype of the metal cooled reactors. The BORAX III reactor, a BWR prototype, actually lit the town of Arco in a 1955 demonstration. (More on Argonne history). Argonne-West is a division of the national laboratory operated by the University of Chicago. Stagg Field at the university was home of the world's first nuclear reactor, which was completed in December 1942 by a team of scientists headed by Enrico Fermi. Subsequently, the Graphite Reactor was built at Oak Ridge to demonstrate that plutonium could be produced from uranium. This pilot scale reactor was a predecessor to the production reactors built at Hanford, Washington and is attributed to be the first to generate electricity. In the 1950's and 1960's, a number of smaller reactors of different designs (PWR, BWR, metal cooled, organic coolant, gas cooled) were built and operated. Eventually, in the US, the PWR and BWR designs were the only survivors of the pilot plant stage. The table below shows the history of the early reactors. In Russia at about the same time, the Institute of Physics and Power Engineering developed a 10 MW graphite moderated reactor at Obninsk. This reactor commenced operation in 1954 and was the precursor of the RBMK design. 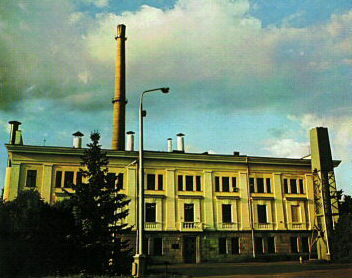 The reactor was used to provide district heating for many years. The reactor is now shutdown. Subsequently, larger reactors were designed and operated starting with the San Onofre 1 and Connecticut Yankee PWRs in 1967 and Oyster Creek and Nine Mile Point 1 BWRs in 1969. These newer reactors were rated at 400 to 600 MWe. Argonne and Oak Ridge National Labs, DOE and NRC have each provided short histories of nuclear power. Copyright � 1996-2006. The Virtual Nuclear Tourist. All rights reserved. Revised: December 21, 2005.